Fast one minute warm-up time. Fixed 39-inch per minute laminating speed. 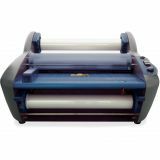 GBC Ultima 35 EZload Roll Laminator, 12" Wide, 5mil Maximum Document Thickness - Thermal roll laminator with unique EZLoad roll film is simple to use, fast and flexible. Ideal for broad-based applications in any size school, office or small business center. 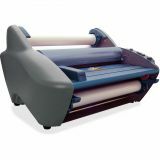 The RollSeal Ultima 35 EZload bridges the gap between pouch laminating and traditional roll laminators by offering a 12 roll laminator with a unique EZload Roll Film System. Load your film fast and mistake-free every time. Laminates widths up to 12" and all lengths. 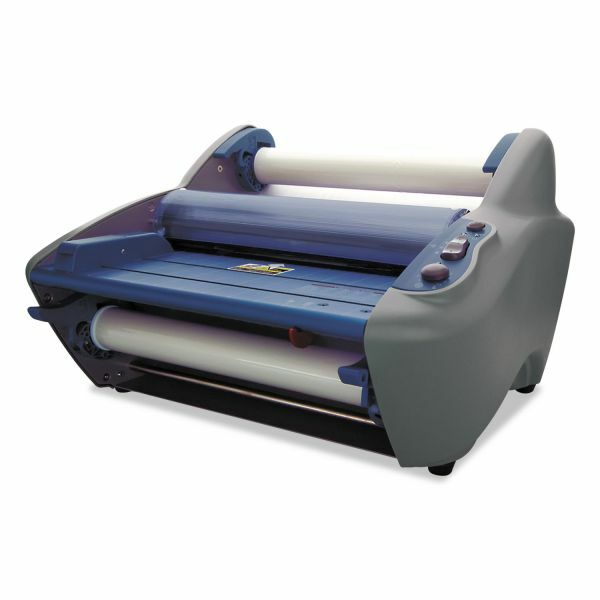 Laminator offers auto shutoff after one hour of nonuse and integrated trimmer so no more searching for scissors. Runs NAP II film with 1.7 mil to 10 mil thickness. Offers variable temperature, one-minute, warm-up time, and fixed speed of 3' per minute. Weighs 35.2 lb." Laminates documents up to 12 inches wide. Built-in trimmer, reverse and auto shut-off functions. Heat Shoe Accutherm™ heating technology delivers reliable, consistent results. Auto standby after one hour and shut off after two hours of inactivity.